Israel has seemingly defied the Seat Product Model in recent years, with a top seat-winning party smaller than expected, and a number of parties greater than expected, based on its electoral system. To be fair to the Seat Product Model (SPM)–and who would not want to be fair to the SPM?–in earlier years of the state, the largest party had been bigger than expected and the number of parties smaller. On average, over its 70+ years, the State of Israel is pretty close to a normal country, at least as far as the SPM is concerned. But, oh, those fluctuations! And it had been many years since it was not overly fragmented, even given an electoral system that invites fragmentation through use of a single nationwide district. At last, 2019 produced a result over which we can all sigh with relief. Someone got the memo, and the election produce a totally compliant result! Here are the seat totals and percentages for each of the parties that cleared the threshold. The Seat Product Model gives us a baseline expectation from the “seat product”, which is defined as the mean district magnitude, times the assembly size. Then the seat product is raised to a given exponent, based on deductive logic as to what the outcome of interest should be expected to be, on average. In the case of the largest party, the exponent is –1/8. The largest party in the 2019 Israeli election, Likud, is one seat off the 30% (which would be 36, which actually was the number in the preliminary count), at 29.17%; the expectation is a share of 0.302=(120 x 120)^–1/8. So the ratio of actual to expected is 1.036. So just about right on target. The SPM exponent for the number of parties winning at least one seat is 1/4, which yields an expectation of 10.95. The actual number was 11. For the effective number of seat-winning parties, the exponent is 1/6, for an expectation of 4.93. The actual value from the above seat shares works out to 5.24, which is 1.062 times the expectation. All in all, totally normal! So, how did this happen, quite apart from the strong pull of the SPM, given that everyone presumably had plenty of time to read the book, which was published in 2017? My main answer is strategic voting, following upon strategic alliance formation. The forging of the Blue & White alliance in late February, gave the opposition at least a sense of momentum and opportunity to defeat Netanyahu and Likud. The alliance surely benefited a great deal from voters deserting other parties in the opposition in order to bolster B&W. At the same time, many voters on the right no doubt feared B&W just might win, and so defected to the strongest party in the bloc, Likud. Never mind that this sort of within-bloc strategic voting is not entirely rational–the government will be the set of parties that can reach 61 votes, whether or not that set includes the largest party overall. Voters may not understand that fully, or may expect that if one of the top two parties could be at least a few seats ahead of the other, it might be politically difficult for the second to form the government even if it was mathematically feasible. Such strategic voting would explain why Labor did so poorly. It had been polling near ten seats, which would have been bad enough for the once grand party. But that it ended up on an embarrassing six is probably attributable to strategic defection to B&W. Similarly, Meretz’s very close scare, winning only 4 seats on 3.63% of the votes. The threshold is 3.25%. Speaking of the threshold, one of the big stories of the election was the failure of New Right to clear it, ending up at 3.22%, despite having been at 6-8 seats in most polls throughout the campaign. That, too, may be due to strategic defection, to either Likud itself or back to the alliance that New Right leaders Naftali Bennet and Ayelet Shaked split from, Bayit Yehudi (running within the new Union of Right Wing Parties). In the recent past, I have felt that the low threshold–formerly 2% and even lower–was not the issue driving fragmentation. And, in fact, the increases in the threshold in 2003 and 2015 (with the last increase actually leading to a moderately high threshold, not a “low” one) did little to bring fragmentation down, as the graph above shows. The driver of fragmentation was the absence of a real “big” party–with even Likud struggling to break 25%–and a surplus of mid-sized parties, which I am defining as parties with around 10-20 seats apiece. Well, this time the party system really looks different, with a leading party exactly the expected size, a second party almost its equal, and then a bunch of little parties. That implies that a somewhat higher threshold–either 4% or 5%–could make a difference, after all. Now would be a good time to seize the day, and form a unity government to do just that. Of course, that is unlikely to happen for various reasons, some of which I mentioned in the previous post. And high thresholds can have perverse outcomes, leading to greater risk of some relevant segment of the electorate being left out. Speaking, still, of thresholds, I should acknowledge something about the fit to the SPM. The SPM formulas used above do not take thresholds into account. Why not? Simple. Because the formulas work without taking them into account! However, had there been no threshold, the Israeli result would have been different, obviously. Even if we assume no change in party/alliance formation in the absence of a threshold (massive and unrealistic assumption), three more parties would have won seats: Zehut (2.7%) and Gesher (1.7%), in addition to New Right. So then we are up to 14 parties, and some corresponding increase in the effective number and decrease in size of the largest. In Votes from Seats, we propose some “first approximation” predictive models based on thresholds instead of the seat product. Given a threshold of 3.25%, these predict a largest party of 42.5% (or a little less with a “second approximation” that I will leave aside here), and an effective number of parties of 3.13. As we can see, these do not do so well on the Israeli election of 2019. So the SPM has it, notwithstanding the complication of the threshold making the SPM fit better than it might otherwise for this election. Finally, a totally normal election in Israel. I have neglected to publish a link that has been available since December–the article announcing the datasets used in Votes from Seats (national and district) was published in Research & Politics (open access). For decades, datasets on national-level elections have contributed to knowledge on what shapes national party systems. More recently, datasets on elections at the district level have advanced research on subnational party competition. Yet, to our knowledge, no publicly accessible dataset with observations of the party system at both national and district levels exists, limiting the ease with which cross-level comparisons can be made. To fill this gap, we release two corresponding datasets, the National Level Party Systems dataset and the District Level Party Systems dataset, where the unit of analysis is the party system within either the national or district jurisdiction. More than 50 elections in the two datasets are overlapping, meaning they include observations for a single election at both the district and national levels. In addition to conventional measures such as the effective number of parties, we also include underutilized variables, such as the size of the largest party, list type, and the vote shares for presidential candidates in corresponding elections. The datasets themselves can be accessed directly at Dataverse. Is AV just FPTP on steroids? Of course, the claim that AV would be FPTP on steroids implies that, were Canada to switch to AV, the current tendency towards inflated majorities for a party favored by less than half the voters would be even more intensified. This is plausible, inasmuch as AV should favor a center-positioned party. A noteworthy feature of the Canadian party system is the dominance, most of the time, by a centrist party. This is unusual in comparison with most other FPTP systems, notably the UK (I highly recommend Richard Johnston’s fascinating book on the topic). The party in question, the Liberal Party, would pick up many second preferences, mainly from the leftist New Democratic Party (NDP) and so, according to the “steroids” thesis, it would thus win many more seats than it does now. It might even become a “permanent majority”, able to win a parliamentary majority even if it is second in (first-preference) votes to the Conservatives (who thus win the majority or at least plurality of seats under FPTP). The “steroids” claim further implies that the NDP would win many fewer seats, and thus Canada would end up with more of a two-party system rather than the multiparty system it has under FPTP. There is a strong plausibility to this claim. We can look to the UK, where AV was considered in a referendum. Simulations at the time showed that the Liberal Democrats would stand to benefit rather nicely from a change to AV. While the LibDems are a third party, heavily punished by the FPTP electoral system even when they have had 20% or so of the votes, what they have in common with the Canadian Liberals is their centrist placement. Thus, perhaps we have an iron law of AV: the centrist party gains in seats, whether or not it is already one of the two largest parties. An important caveat applies here: with the LibDems having fallen in support since their coalition with the Conservatives (2010-15), the assumptions they would gain from AV probably no longer apply. It is not as if Australia has never had a center-positioned party. The Australian Democrats, for example, reached as high as 11.3% of the first-preference votes in 1990, but managed exactly zero seats (in what was then a 148-seat chamber). Thus being centrist is insufficient to gain from AV. Nonetheless, the combination of centrism and largeness does imply that Canada’s Liberals would be richly rewarded by a change to AV. Or at least it seems that Justin Trudeau thought so. His campaign promised 2015 would be the last election under FPTP. While he did not say what would replace it, he’s previously said he likes a “ranked ballot” and he pulled the plug on an electoral-reform process when it was veering dangerously towards proportional representation. Still, there are reasons to be somewhat skeptical, at least of the generalization of the Australian two-party experience. The reasons for my caution against the “steroids” view are two-fold: (1) the overlooked role of assembly size; (2) the ability of parties and voters to adapt. Assembly size is the most important predictor of the size of the largest party, disproportionality, and the effective number of seat-winning parties in countries that use single-seat districts. (It is likely relatively less important when there are two rounds of voting, as in France, but still likely the most important factor.) This is a key conclusion of Votes from Seats. It is thus important not to overlook the fact that Australia has an assembly size considerably smaller than Canada’s. In the book, Taagepera and I show that Australia’s effective number of seat-winning parties and size of largest parliamentary party are almost what we would expect from its assembly size, even if FPTP were used. (See also this earlier post and its comment thread; how close it is to expectation depends on how we count what a “party” is.) 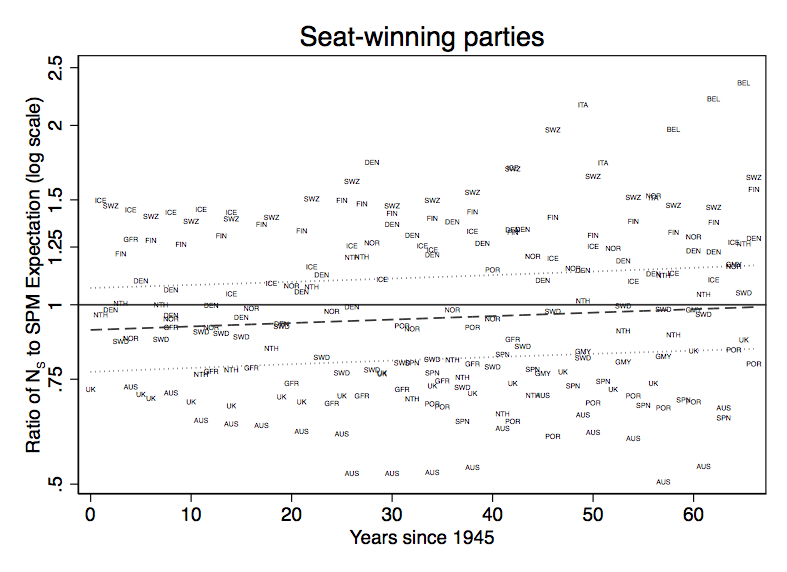 The data are calculated over the 1949-2011 period, and the effective number of parties has been just 1.10 times the expectation from the Seat Product Model (which is based only on assembly size when single-seat districts are used). Similarly, the average largest party has been 93% of the expected size (averaging 54.2% of seats when we would expect 50.5%). Thus we do not need to invoke the alleged steroids aspect of AV to understand the dominance of two parties in Australia. But this does not mean it would not make a difference in Canada. Consider that the current effective number of parties and size of the largest party in that country, averaged over a similar period, are also just about what we should expect. 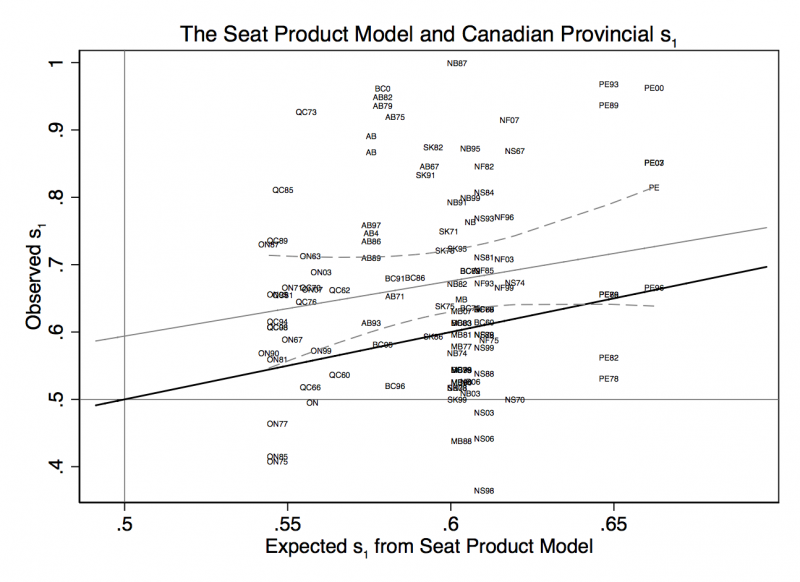 The multipartism, including periodic minority governments, that characterize Canada are not surprising, when you use the Seat Product Model (SPM). They are surprising only if you think district magnitude is all that matters, and that FPTP is FPTP. But it isn’t! An electoral system using the FPTP electoral rule with an assembly of more than 300 seats is a different, and more multiparty-favoring, electoral system than one with 150 seats. Replace “FPTP” in that sentence–both occurrences–with “AV” and it is surely still true. Parties and voters have a way of adapting to rules. Yes the Liberals are centrist, and yes the Conservatives are mostly alone on the right of the spectrum (albeit not quite as much now, heading into 2019, as in recent years). But that need not be an immutable fact of Canadian politics. Under AV, the Liberals might move leftward to attract NDP second preferences, the NDP center-ward to attract Liberal and even Conservative second preferences, the Conservatives also towards the center. It would be a different game! The Greens and other parties might be more viable in some districts than is currently the case, but also potentially less viable in others where they might win a plurality, but struggle to get lower ranked preferences. The point is, it could be fluid, and there is no reason to believe scenarios that have the largest party increasing in size (and being almost always the Liberals), and correspondingly the effective number of parties falling. With 338 or so districts, likely there would remain room for several parties, and periodic minority governments (and alternations between leading parties), just as the SPM predicts for a country with that assembly size and single-seat districts. As I have noted before, it is the UK that is the surprising case. Its largest party tends to be far too large for that huge assembly (currently 650 seats), and its effective number of seat-winning parties is “too low”. Maybe it needs AV to realize its full potential, given that the simulations there showed the third party benefitting (at least when it was larger than it’s been in the two most recent elections). Bottom line: I do not buy the “FPTP on steroids” characterization of AV. I can understand were it comes from, given the presence in Canada of a large centrist party. I just do not believe Liberal dominance would become entrenched. The large assembly and the diversity of the country’s politics (including its federal structure) both work against that. I agree with electoral reformers that PR would be better for Canada than AV. I also happen to think it would be better for the Liberals! But would AV be worse than FPTP? Likely, it would not be as different as the “steroids” claim implies. 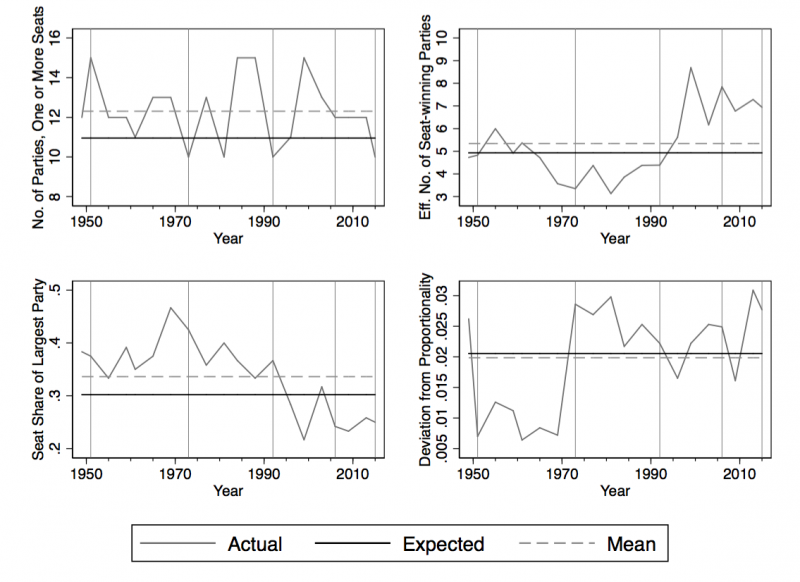 Is the effective number of parties rising over time? 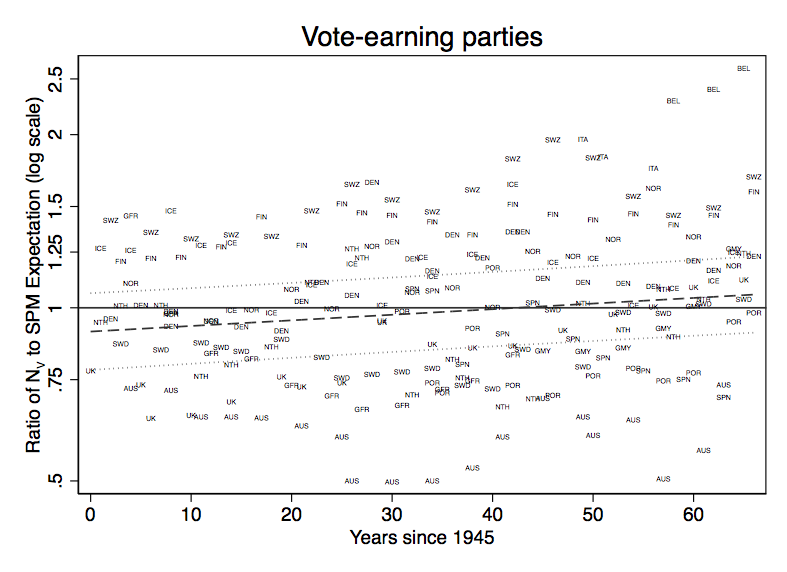 I was recently having a conversation with another political scientist who showed me a graph that suggests the effective number of vote-earning parties in established democracies has been increasing over time. I was skeptical that it was, relative to baseline. Of course, if we do not have a baseline, we do not really know what is causing any such possible increase. The baseline should be the Seat Product Model, which tells us what we should expect the effective number of parties to be, given the electoral system. When we do the baseline, the increase over time remains, but is not significant. Here is a graph with no baseline. It is just the the effective number of vote-earning parties (NV) in Western Europe (most countries–see below for notes on coverage). The scatterplot marks elections by a three-letter abbreviation for each country. The x-axis is years since 1945, the earliest election year in the dataset. The graph’s y-axis is unlogged, but the plotted regression curve and 95% confidence intervals are based on a logged NV. There does seem to be an increase over time. The regression estimates NV averaging around 3.42 in 1945 and around 4.60 in 2011. The 95% confidence intervals on those estimates are 2.96 – 3.96 and 3.98 – 5.32, respectively. 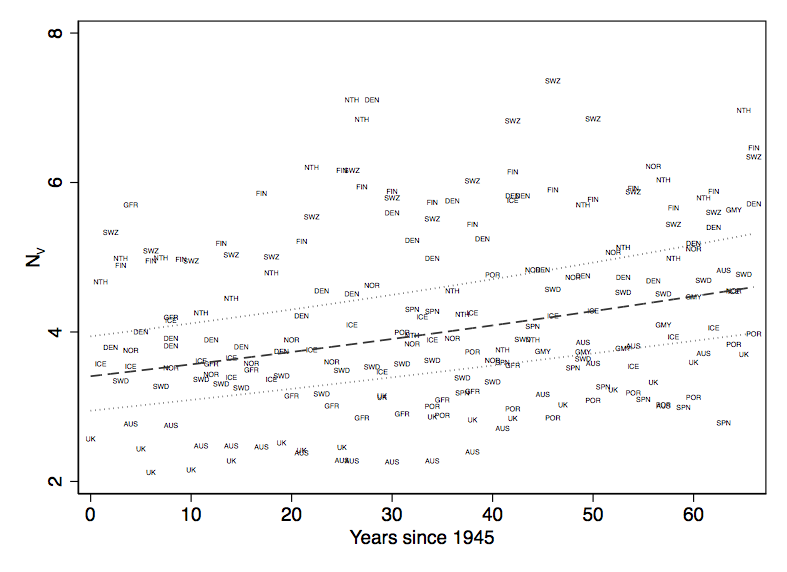 So, yes, the vote is getting more fragmented over time in Western Europe! But hold on a moment. We should look at the fragmentation relative to baseline. As shown in Votes from Seats, the seat product (mean district magnitude times assembly size; in a two-tier system, also taking into account the size of the compensatory tier) explains around 60% of the variance in key party-system outcomes, including the effective number of parties. It would be useful to know if the Seat Product Model (SPM) is on its way to being unable to account for party-system fragmentation if current trends continue. It would be useful to know if recent fragmentation is part of that other 40% (i.e., the amount of variance in NV that the SPM can’t account for). That is, are we witnessing some inexorable fragmentation of party systems that is resulting from the breakdown of existing party alignments in the electorate, and which electoral systems have begun to lose their ability to constrain? Should Western European countries go so far as to reduce their proportionality, in order to contain fragmenting trends? Here it is, for NV, again with the estimates from a GLS regression and the 95% intervals. In the regression, the ratio is entered as its decimal log, but the graph uses the underlying values for ease of interpretation. What we see is indeed an increase (note the slope of the dashed line). However, the reference line at 1.00 (the log of which is, of course, zero) is easily within the 95% confidence interval of the regression throughout the six and a half decades of the data series. The regression estimates a ratio of actual to SPM of 0.911 in 1945 and 1.054 in 2011. The 95% confidence intervals are 0.782 – 1.062 and 0.905 – 1.228, respectively. In other words, the increase is not statistically significant. There may in fact be an increase, which is to say that something in that other 40% is driving, over time, the SPM to be less successful at predicting the fragmentation of the vote. However, it could just be “noise”; we really can’t say, statistically, because of 1.00 remaining well within the confidence interval. If it continues on current pace, then 1.00 (or rather its log) will be outside the confidence interval on NV as soon as the year 2065. I will put it on my calendar to check how we are doing at that time. Independent of the statistical significance, there could be something of interest going on. Note that the regression trend does not cross the 1.00 line till about 42 years into the time series (i.e., 1987). This suggests that, prior to that time, the average election in Western Europe saw the vote be less fragmented than it “should have been”, according to its electoral system. That could suggest that major party organizations were partially overriding the electoral-system effect (producing party systems on average around 90% as fragmented as expected) in the early post-war years. In more recent times, the weakening of party alignments could be making the electoral system expectation finally be realized, with some tendency to exceed in recent times. But we really can’t say, given that the main conclusion is the SPM is all right, and should be for a little while yet, even if the current trend continues (which, of course, it might not). I also wanted to checked the parliamentary party systems, that is, the effective number of seat-winning parties (NS). Here it is even more clear that the SPM is doing all right! It is only about now that the regression estimate has finally reached 1.00, but the rate of increase is more minor than with NV, and clearly of minimal significance. The regression estimates a ratio of actual NS to SPM prediction of around 0.909 in 1945 and 0.991 in 2011. Confidence intervals are 0.773 – 1.068 and 0.843 – 1.164, respectively. It is somewhat interesting that the trend in the ratio for NV is rising above 1.00 before the ratio for NS. Perhaps there’s an explanation of interest in there. The electoral system more directly constrains NS, after all, and voters perhaps are more willing to “waste” votes as party alignments decrease. But it could just be noise. The conclusion is that there is indeed some truth to the notion that West European party systems are fragmenting. However, relative to the Seat Product Model, they are fragmenting at a slow and hardly significant pace. How can that be? Well, perhaps it is obvious, or perhaps it is not. But a country’s seat product tends to increase over time. Most countries included here have expanded their assemblies over time, and some have also increased district magnitudes and/or adopted upper (compensatory) tiers. So, the effective number of parties should increase to some degree over time, even if voters were just as moored to their party organizations and identities as they ever were! On the last point above: Specifically, a GLS regression on expected NS says we should have seen on average NS=3.58 in 1945 but 3.67 in 2011. That is not much, but it means some increase is “baked in” even before we look at how actual voters behave. Some part of the increase is in the 60% rather than the 40%. I dropped Belgium and Italy from the regressions, although they are included in the scatterplots for recent years. The reasons for dropping are that we could not obtain data for the share of seats allocated in upper (compensatory) tiers for the years when these countries used multi-tier PR systems; without that, we can’t calculate the extended version of the SPM (for 2-tier PR). In the later years in the Italy series, when we have such data, these are actually even more complex rules (involving a majoritarian component and alliance vote-pooling), and so the SPM really can’t predict them. In Belgium, the electoral system has been “simple” since 2003, but I think we can agree that there is no semblance of a national party system in that country. France is also not included, partly due to the importance of the elected presidency (after 1965) and partly due to the two-round system for assembly (after 1958). We do show in Votes from Seats that the SPM works pretty well for France nonetheless. So I doubt its inclusion would have altered the results much. But I wanted to stick to the PR systems and FPTP, which the SPM is designed to handle. 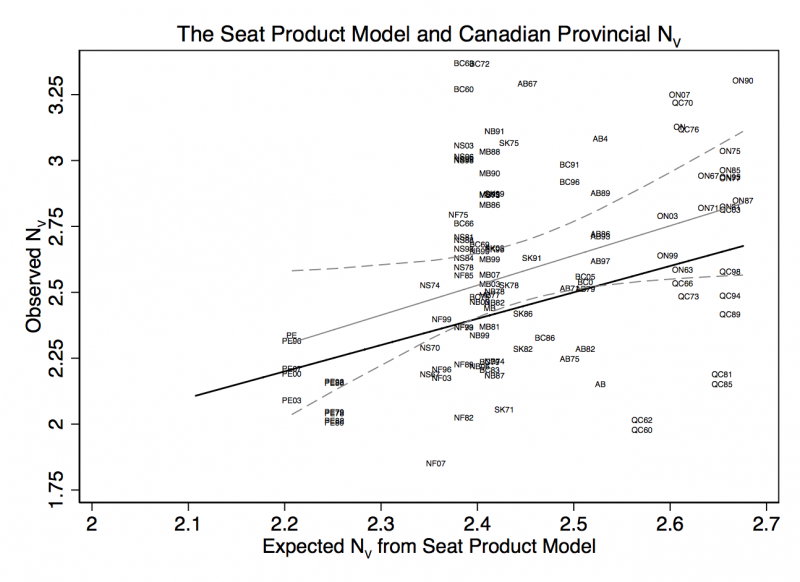 After posting my earlier overview of expectations from possible electoral reform in British Columbia, I was wondering how well the Seat Product Model has performed over time in Canadian provincial assembly elections. Spoiler alert: not nearly as well in the provinces as a whole as in BC, and better for votes than for seats. The latter is particularly puzzling; the model works by first estimating seats (which are more “mechanically” constrained by district magnitude and assembly size than are votes). That is why the book Rein Taagepera and I published in 2017 is called Votes from Seats. The key to the puzzle may be the serious under-sizing of Canadian provincial assemblies. As I will show in a table at the end of this entry, many provincial assemblies should be almost twice their current size, if we go by the cube root law. I have a dataset originally constructed for my “to keep or change FPTP” project (published in Blais, ed., 2008). It has most provincial elections back to around 1960, although it stops around 2011. Maybe some day I will update it. For now, it will have to do. The first graph shows the degree of correspondence between a given election’s observed effective number of vote-earning parties (NV) and the expectation from its seat product (i.e., for FPTP, the assembly size). The black diagonal is the equality line: perfect prediction would place an election on this line. The lighter diagonal is a regression line. Clearly, the mean Canadian provincial election exhibits NV higher than expected. On the other hand, the 95% confidence interval (dashed curves) includes the equality line other than very trivially near the middle of the x-axis range. 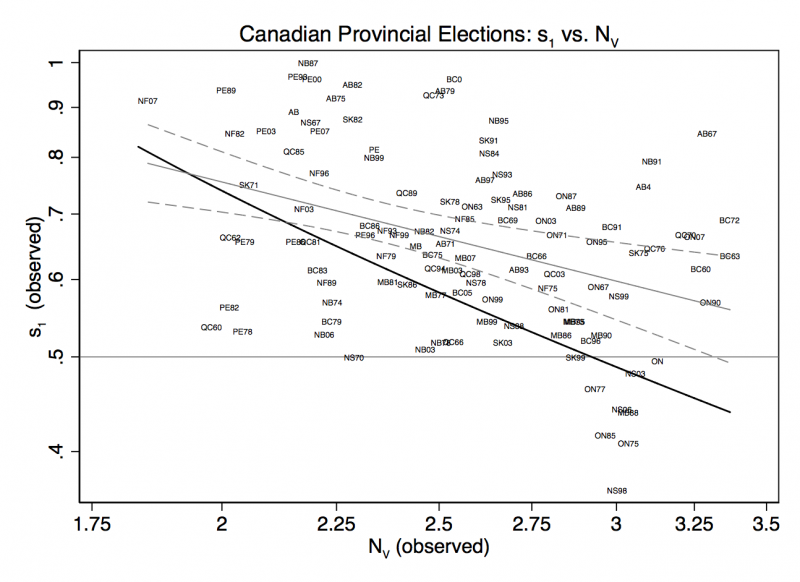 Thus, in statistical terms, we are unable to reject the hypothesis that actual NV in Canadian provincial elections is, on average, as expected by the SPM. However, the regression-estimated line is systematically on the high side. It might be noted that we never have NV expected to be 2.0, and in the largest provinces, the assemblies are large enough that we should expect NV>2.5. (“Large enough” here meaning independent of what they “should be”, by the cube root; this is referring only to actual assembly size.) So the classic “Duvergerian” outcome is really only expected in the one province with the smallest assembly. And such an outcome is more or less observed there, in PEI. Nonetheless, a bunch of elections are very much more fragmented than expected, with NV>3! And several are unexpectedly low; many of these are earlier elections in Quebec. All individual elections are labelled; in a few cases the label generation did not work well (some elections in 2000s). The regression coefficient is significant, although the regression’s R2 is only 0.15. The basic conclusion is a marginally acceptable fit on average, but lots of scatter and some tendency for the average election to be more fragmented than expected. Now, for the largest seat-winner in the assembly (s1). Here things get a little ugly. This might be considered a rather poor fit. There is a systematic tendency for the largest party to be bigger than expected: note that the equality line is essentially never within the 95% confidence interval. When we expect, based on assembly size, the largest party to have 60% of the seats, it actually tends to have more like 68%. More importantly, the scatter is massive. In fact, the regression coefficient is insignificant here; please do not ask what the R2 is! The size of Canadian provincial parliaments is never so large that the leading party is expected to have only 50% of the seats (note the reference lines and where the equality line crosses the 50-50 point). Yet there is not a trivial number of elections with the largest party under 50%. More common, however, are the blowout wins, where the largest party has 80% or more of the seats. This has been a chronic feature of Canadian provincial politics, especially in a few provinces (notably Alberta, New Brunswick, and Prince Edward Island). Why is Nv so much better predicted (even if not exceptionally well) than s1? It is hard to say. It is an unusual situation to have both NV and s1 trend higher than expected. After all, normally the more “significant” parties there are the smaller the largest party should tend to be. In the set of predictive equations, s1 (and the effective number of seat-winning parties, NS) are prior to NV, because the seat-based measures are more directly constrained. This is why the book is called Votes from Seats. In our diagram (p. 149) deriving the various quantities from the seat product, we show NV and s1 coming off separate branches from “Ns0” (the actual number of parties winning seats), which is expected to be (MS)0.25, where M is the magnitude and S the assembly size. Thus for FPTP, it is S0.25. A parliament with 81 seats is expected to feature three parties; the other formulas would predict that NS=2.08, s1=0.577, and NV=2.52. If the parliament had 256 seats, we would expect four parties, NS=2.52, s1=0.50, and NV=2.92. In this last graph, I plot this expectation with the solid dark line, and a regression on s1 and NV from Canadian provincial elections as the lighter line (with its 95% confidence intervals in dashed curves). The pattern is obvious: there are many elections in Canadian provinces in which the leading party gets a majority or even 60% or 70% or more of the seats despite a very fragmented electorate. We should not expect a leading party with more than 50% of the seats when NV>2.92. And yet 17 elections (around 15% of the total) defy this logically derived expectation. Six have a party with 2/3 or more of the seats despite NV>2.92 (in order of increasing NV: BC91, AB04, NB91, QC70, AB67, BC72; in the last one, NV=3.37!). There is some support for this. I can calculate what s1 and NV would be expected to be, if the assemblies were the “right” size, which is to say the cube root of the number of voters (which is obviously smaller than the number of citizens, but this is what I have to work with). I will call these s1cr and NVcr. Then I can take ratios of actual s1 and actual NV to these “expectations”. The mean ratios are: NV/NVcr=0.994; s1/s1cr=1.19. If the assemblies were larger, the votes–already with a degree of fragmentation about as expected from more properly sized assemblies–would probably have stayed about the same. However, with these hypothetically larger assemblies, the largest party in parliament would be less inflated by the mechanics of the electoral system. Canadian provinces would have a greatly reduced tendency to have lopsided majorities if only they would expand their assemblies up to the cube root of their active voting population. Of course, this assumes they stick to FPTP. The other thing they could do is switch to (moderately) proportional representation systems, like BC is currently considering. That would be seem to be a good idea regardless of whether they also correct their undersized assemblies. What could we expect from electoral reform in BC? This week is the beginning of the mail voting period for the referendum on whether to reform the electoral system for provincial assembly elections in British Columbia. The ballot asks two questions: (1) Do you want to keep the current FPTP system or “a proportional representation voting system”: (2) If BC adopts PR, which of three types of PR do you prefer? The second question offers three choices, which voter may rank: Mixed-Member Proportional (MMP); Dual-Member Proportional (DMP); Rural-Urban Proportional (RUP). I have reviewed before what these options entails, and will not repeat in detail here. Besides, the official BC Elections site explains them better than I could. What I want to try to get it here is how we might expect BC’s provincial party system to change, were any of these options adopted. To answer that question, I turn, of course, to the Seat Product Model, including the extended form for two-tier systems developed in Votes from Seats. The punch line is that the various scenarios I ran on the options all suggest the effective number of parties in the legislative assembly would be, on average, somewhere in the 2.46 to 2.94 range, the effective number of vote-earning parties would tend to be in the 2.83 to 3.32 range, and the size of the largest party would be somewhere between 45% and 51% of the seats. Again, these are all on average. The ranges just provided do not mean elections would not produce a largest party smaller than 45% or larger than 51%. Actual elections will vary around whatever is the point prediction of the Seat Product Model for any given design that is adopted. And fine, yet important, details of whichever system is adopted (if FPTP is not retained) will remain to be fleshed out later. The ranges I am giving are formula-predicted averages, given the inputs implied by the various scenarios. I explain more below how I arrived at these values. The key point is that all proposals on the ballot are quite moderate forms of PR, and thus the party system would not be expected to inflate dramatically. However, coalition governments, or minority governments with support from other parties, would become common; nonetheless, single-party majority governments would not likely disappear from the province’s future election outcomes. As we shall see, one of the proposals would make single-party governments reman as the default mean expectation. Before going to the scenarios, it is important to see whether the real BC has been in “compliance” with the Seat Product Model (SPM). If it has tended to deviate from expectations under its actual FPTP system, we might expect it to continue to deviate under a new, proportional one. Fortunately, deviations have been miniscule. For all elections since 1960, the actual effective number of vote-earning parties has averaged 1.117 times greater than predicted. That is really minor. More important is whether it captures the actual size of the largest party well. This, after all, is what determines whether a single-party majority government can form after any given election. For all elections since 1960, the average ratio of actual largest-party seat share to the SPM prediction is 1.068. So it is even closer. For an assembly the size of BC’s in recent years (mean 80.7 since 1991), the SPM predicts the largest party will have around 57.8% of seats. The mean in actual elections since 1991 has been 62.7%. That is a mean error on the order of 4 seats. So, the SPM captures something real about the current BC electoral system. Going a little deeper, and looking only at the period starting in 1996, when something like the current party system became established (due to the emergence of the Liberals and the collapse of Social Credit), we find ratios of actual to predicted as follows: 1.07 for effective number of vote-earning parties; 1.07 for largest parliamentary party seat share; 0.905 for effective number of seat-winning parties. If we omit the highly unusual 2001 election, which had an effective number of parties in the assembly of only 1.05 and largest party with 96.2%, we get ratios of 0.98 for effective number of seat-winning party and 0.954 for largest party size. The 2017 election was the first one since some time before 1960 not to result in a majority party, and it is this balanced parliament that is responsible for the current electoral reform process. As for the proposed new systems, all options call for the assembly to have between 87 seats (its current size) and 95 seats. So I used 91, the mean; such small changes will not matter much to the estimates. With t=.4, M=1 (in the basic tier) and S=91, this results in Ns=2.81. I will show the results for other outputs below. For the DMP proposal, the calculations depend on how many districts we assume will continue to elect only one member of the legislative assembly (MLA). The proposal says “rural” districts will have just one, to avoid making them too large geographically, while all others will have two seats by combining existing adjacent districts (if the assembly size stays the same; as noted, the proposals all allow for a modest increase). In any case, the first seat in any district goes to the party with the plurality in the district, and the second is assigned based on province-wide proportionality. For my purposes, this is a two-tier PR system, in which the compensatory tier consists of a number of seats equivalent to the total number of districts that elect a second MLA to comprise this compensatory pool. Here is where the scenarios come in. I did two scenarios, one with minimal districts classified as “rural” and one with more. The minimal scenario has 5 such districts–basically just the existing really large territorial ridings (see map). The other has 11 such districts, encompassing much more of the interior and north coast (including riding #72, which includes most of the northern part of Vancouver Island). I will demonstrate the effect with the minimal-rural scenario, because it turned out to the most substantial move to a more “permissive” (small-party-favoring) system of any that I looked at. Of our 91 seats, we take out five for “rural” districts, leaving us with 86. These 86 seats are thus split into 43 “dual-member” districts. The same formula as above applies. (Votes from Seats develops it for two-tier PR, of which MMP is a subset.) The total number of basic-tier seats is 48 (the five rural seats plus the 43 DM seats). There are 43 compensation seats, which gives us a tier ratio, t=43/91=0.473. Ah ha! That is why this is the most permissive system of the group: more compensation seats! Anyway, the result is Ns=2.94. If we do the 11-rural seat scenario, we are down to 80 seats in the DM portion of the system and thus 40+11 basic-tier seats. The tier ratio (40/91) drops to 0.44. The resulting prediction is Ns=2.61. This does not sound like much, and it really is not. But these results imply a difference for largest seat size between the first scenario (45%) and the second (49%) that makes a difference for how close the resulting system would be to making majority parties likely. Finally, we have RUP. This one is a little complex to calculate because it is really two different systems for different parts of the province: MMP for “rural” areas and STV for the rest. I am going to go with my 11 seats from my second DMP scenario as my “rural” area. Moreover, I understand the spirit of this proposal to be one that avoids making the districts in rural areas larger than they currently are. Yet we need compensation seats for rural areas, and like the full MMP proposal, RUP says that that “No more than 40% of the total seats in an MMP region may be List PR seats”, so this region needs about 18 seats (the 11 districts, plus 7 list seats, allowing 11/18=0.61, thereby keeping the list seats just under 40%.) That leaves us with 91-18=73 seats for the STV districts. The proposal says these will have magnitudes in the 2-7 range. I will take the geometric mean and assume 3.7 seats per district, on average. This gives us a seat product for the STV area of 3.7*73=270. In Votes from Seats, we show that at least for Ireland, STV has functioned just like any “simple” PR system, and thus the SPM works fine. We expect Ns=(MS)^.167=2.54. However, this is only part of the RUP system. We have to do the MMP part of the province separately. With just 11 basic-tier seats and a tier ratio of 0.39, this region is expected to have Ns=2.13. A weighted average (based on the STV region comprising 80.2% of all seats) yields Ns=2.46. The key point from the above exercise is that RUP could result in single-party majority governments remaining the norm. Above I focused mainly on Ns expectations. However, all of the predictive formulas link together, such that if we know what we expect Ns to be, we can determine the likely seat-share of the largest party (s1) will be, as well as the effective number of vote-earning parties (Nv). While that means lots of assumptions built in, we already saw that the expectations work pretty well on the existing FPTP system. “DMP1” refers to the minimal (5) seats considered “rural” and DMP2 to the one with 11 such seats. If we went with more such seats, a “DMP3” would have lower Ns and Nv and larger s1 than DMP2, and the same effect would be felt in RUP. I did a further scenario for RUP with the MMP region being 20 districts, and wound up with Ns=2.415, Nv=2.83, s1=.52; obviously these minor tweaks do not matter a lot, but it is clear which way the trend goes.And whether any given election is under or over s1=0.50 obviously makes a very large difference for how the province is governed for the following four years! I would not really try to offer the above as a voter guide, because the differences across systems in the predicted outputs are not very large. However, if I wanted to maximize the chances that the leading party would need partners to govern the province, I’d probably be inclined to rank MMP first and RUP third. The latter proposal simply makes it harder to fit all the parameters together in a more than very marginally proportional system. By the way, we might want to compare to the BC-STV proposal that was approved by 57% of voters in 2005 (but needed 60%, and came up for a second referendum in 2009, when no prevailed). That proposal could have been expected to yield averages of Ns=2.61, Nv=3.0, and s1=.49. By total coincidence, exactly the same as my DMP2 scenario. A final note concerns the regional compensation in the MMP proposal vs. province-wide in DMP. In an on-line appendix to Votes from Seats, I explored whether regional compensation in the case of Scotland produces a less permissive system than if compensation were across all of Scotland. I concluded it made no difference to Ns or s1. (It did, however, result in lower proportionality.) Of course, if it made a difference, province-wide would have to be more favorable to small parties. Thus if this were a BC voter’s most important criterion, DMP might pull ahead of MMP. However, the benefit on this score of DMP is greater under a “low-rural” design. The benefit of DMP vanishes, relative to MMP, if the system adopted were to be one with a higher share of seats marked as rural. I certainly am unable to predict how the design details would play out, as this will be left up to Elections BC. The bottom line is that all proposals are for very moderately proportional systems, with MMP likely the most permissive/proportional on offer. Brazil is a classic case of open-list proportional representation (OLPR): lists win seats in proportion to their collective votes in a district (state), but candidates within the list are ordered solely according to preference votes obtained as individuals. These rules can result in individual candidates elected with very small preference-vote totals. For the most recent Brazilian election, a new provision has gone into force. There is now a threshold on preference votes that candidates must obtain to be elected. This means that, in a very technical sense, a hybrid element has been brought into the Brazilian system. However, the provision is not the usual hybrid seen in “preferential list” systems, whereby seats not filled on preference votes are filled instead according to a party’s (or coalition’s) pre-determined rank. That hybrid format is what is typically called a flexible list or a semi-open list. However, Brazilian lists remain unranked, except via the preference votes. Rather, in Brazil, a list that has an insufficient number of candidates with above-threshold preference votes forfeits those seats to other lists in the district. The threshold is set at 10% of the electoral quota, which is a Hare quota (1/M, where M is district magnitude). This provision changed the allocation of 8 seats. Given a Chamber of Deputies with over 500 seats, we should not exaggerate the significance of the change, although of course, some other parties might have adjusted either their nomination behavior or their “intra-party vote management” practices (defined below) to avoid being hit by the threshold. In São Paulo, the seven PSL candidates who were not eligible to take seats the list otherwise would have won had vote totals ranging from 19,731 to 25,908. They were replaced by candidates on six different lists with preference votes ranging from 56,033 to 92,257, suggesting the replacements had, on average, about three times the votes of the forfeiting candidates. (The party that picked up two of these seats was the Democrats.) In Rio Grande do Sul, the seat Novo forfeited would have been won by a candidate with 11,003 votes, but was instead filled by a candidate the Brazilian Labor Party (PTB, not to be confused with the PT of Lula) who had 69,904 votes, a preference-vote total 6.35 times greater than that of the forfeiting candidate. As is clear from the vote totals of those who lost under this provision and those who gained, if the intention was to prevent candidates with marginal personal followings from riding in on the “coattails” of strong list-pullers (whose popularity increases the votes of the collective list), then the reformers can declare “mission accomplished”. I am personally quite excited by this provision, which I had missed when summarizing minor changes made to the electoral law in 2017, because I once wrote up a proposal for just such a hybrid. It is in some text that was going to be part of one of the chapters in Votes from Seats, but Rein Taagepera and I decided it was not directly germane to the book and left it out. The chapter it would have been part of compares OLPR to the single non-transferable vote (SNTV) with respect to vote shares of first and last winners, and regarding the extent to which parties do (or do not) manage their intra-party competition. Managing intra-party competition refers to parties doing one or both of: (1) restricting the number of candidates nominated, or (2) intervening in the campaign in an effort to shift votes from non-viable candidates to viable ones. Under SNTV, these intra-party competition-management practices are critical because the total number of seats a party (or set of cooperating parties) can elect is entirely dependent on how many individual candidates it has whose votes are in the top-M vote totals in the district. Under OLPR, parties have no incentive to do this, if their goal is simply to maximize list seats–a list under OLPR can never displace seats to another list due to having “too many” candidates or having the candidates’ vote totals be widely unequal. (Parties may have other reasons to care about which candidates win, and multiple parties running in alliance face an SNTV-like conundrum in that they are competing with one another inside the list to get their candidates into the top s, where s is the number of seats won by the list. But these are separate problems, and the latter is a problem covered in Votes from Seats). The article on the Chamber website is not clear on the precise rule now used in Brazil for deciding on the replacement candidates. In any case, it certainly has a similar effect to my proposal. (From a comment by Manuel at the earlier thread, it seems the forfeited seats are assigned proportionally rather than SNTV-like.) I can’t claim credit, as there is no way any Brazilian official saw my unpublished proposal. But I am pleased that some such a provision has been adopted somewhere. Thanks to Dr. Kristin Wylie (on Twitter) for calling my attention to this article.